Lt. 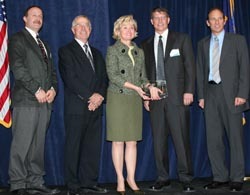 Governor Becky Skillman presented AeroCat High Performance Bicycles with an Entrepreneurship award. Business leaders from across the state joined the ceremony with government officials sponsored by the Indiana Economic Development Corporation's Small Business Development Centers. The Economic Development through Growth Entrepreneurship (EDGE) awards recongnize clients of the agency's 10 regional centers located throughout the state. Award recipients fell into two categories, emerging and established, and were selected individually by the local staff at each of the regional EDGE offices. Among the winners in the "emerging business" category was AeroCat LLC. Based out of Portland, IN., the company is a manufacturer of high performance bicycle products and is operated by Tim and Dave Poole. State Representative Bill Davis joined the presentation of the award. "It was great to see the Poole family's work in the small business sector be recognized," said Rep. Davis. "With their dedication to high-performance bicycles, AeroCat is not only devoted to providing excellent service to their customers but also contributes to the well-being and health of local Hoosiers and many others as well." AeroCat, LLC is headquartered in Portland, Indiana, USA and is a manufacturer of high performance bicycle products. The company is committed to designing and building the finest performing bicycles for riders of all abilities and budgets. For more information visit the company's website at www.aerocatbike.com or contact Dave Poole at 260-703-8001 or email dave.poole@aerocatbike.com.